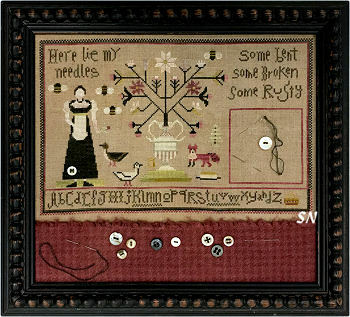 This sampler came totally out of Theresa's head... how that can happen, I just don't know! 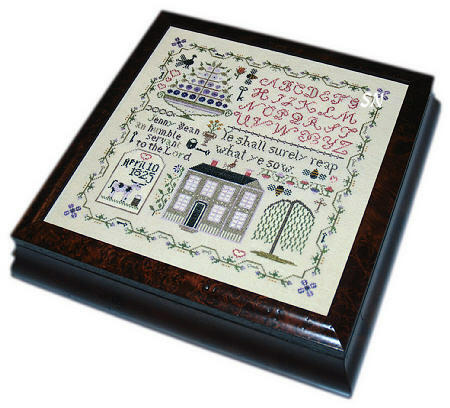 Measuring approx 19 x 23 on 32ct, you get lots of biblical verses, a GORGEOUS border on three sides that repeats NOWHERE! All the evergreens are different, there is one little dog facing the wrong way, tiny birds and critters everywhere, the whole thing is enchanting! Coded for Anchor or DMC floss, add some hand-dyeds if you want. I love every bit if this!!!! A companion to Antique Locks & Keys and Antique Scissors and Spools... this one has teacups! 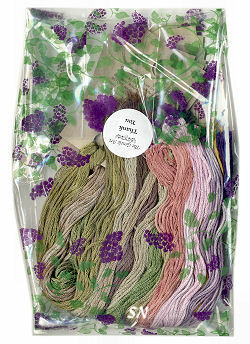 Choose any fabric you like and one color of hand-dyed thread. Theresa stuffs with sawdust, and she likes to dress her cushions with vintage lace. Presented as a small chart. 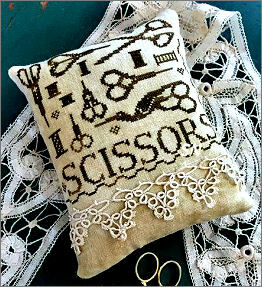 Here's a cute little design that appeals to every stitcher! Especially the scissor-hoarders! Stitch count is 80 x 90. Choose any fabric you want, and any color thread you want! Theresa had some old lace, she added that... she says *do whatever you want!!! * Add a pocket to it somewhere to hold scissors... add some fun trim on the edges... make matching cushions for all your stitch buddies... anything! Offered as a chart. Remember that flier we send you every year around the end of January about the Japanese holiday that celebrates the hard work of NEEDLES? 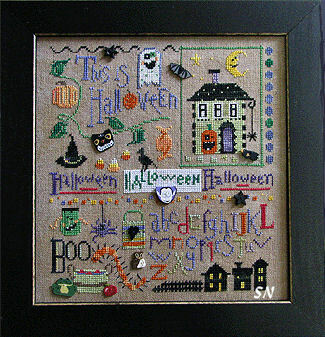 Teresa did this sampler to kind of commemorate that holiday! The Festival of Broken Needles! 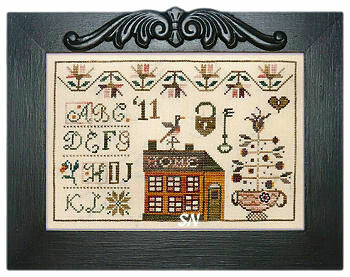 Theresa's sampler is charming! Stitched on hand-dyed linen, it provides a place for you to park broken, rusted or old needles... you can even leave threads in them from special projects. (What about finding Mom's needles still threaded... you could preserve some of them here.) *Here lies my needles, some bent, some broken some rusty. 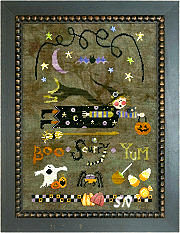 * Finishing approx 11 x 8, stitched with hand-dyed flosses, garnish this with antique buttons. The bottom area is a cut of Weeks Dye Works Red Pear Houndstooth wool.. isn't it pretty on there? Really a special piece for a stitcher. Presented as a chart. No set release dates for subsequent parts, but each part's chart will run you $8. This collection released in Feb 2018, we expect a 12-month timeframe. AWESOME... this little piece can be stitched on ANYTHING, but the model is worked over ONE on 40 silk gauze! CHOOSE ANYTHING! This is dedicated to Teresa's three favorite and best friends -- Jennifer, Kathy and Sue. She tells you to notice the friend on the left is very put-together -- nice big house, and flowers in the urn. The friend on the right has a home made and patched dress with a simpler house, crazier hair and wildflowers. *We're all of us different, but true friends know what counts is on the inside. * Presented as a chart... it's 4 x 4 on the gauze, but can be 11 x 12 on 28ct! Gorgeous! 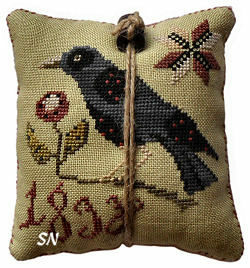 Our cute little bird pin cushion is back, choose Weeks 32ct hand-dyed for him. Finishing about 4 x 4, the chart comes with the threads, jute and little black painted wooden spool - kind of a fun finishing treatment. 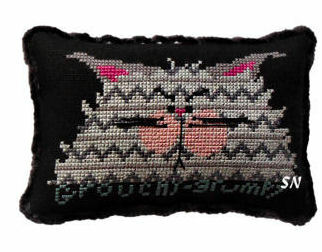 Anyway, Grouchy comes with a cut of Taupe, gray and black angry cat finishing material... so it finishes approx 3 x 4-1/2. Use flosses from your stash. 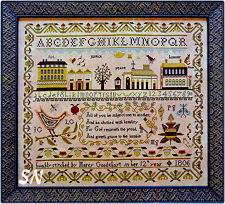 Shakespeare's Peddler has a new ORIGINAL sampler design -- and it is so very pretty!!! Theresa has outdone herself with this gorgeous piece... "All of you be subject to one another, and be clothed with humility. For God resisteth the proud and giveth grace to the humble." 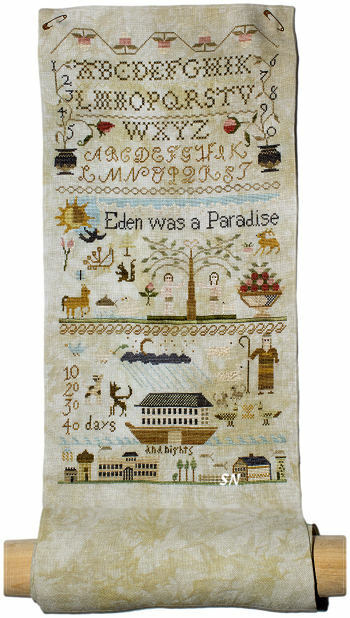 The stitch count is 315 x 273, so it finishes approx 17 x 20 on 32ct. 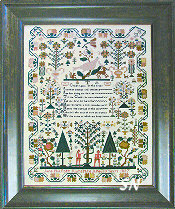 Charted for Needlepoint Silk or DMC floss, her color selection is dusty, but pretty -- not too dark or drab. 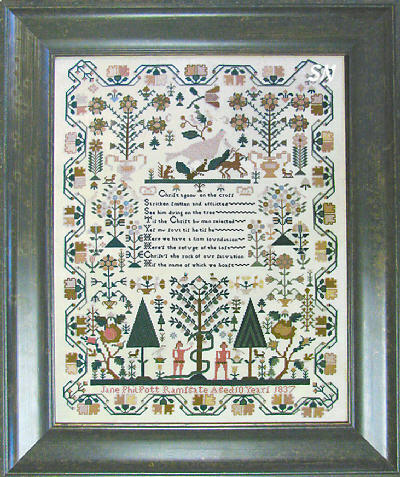 The border is different on all 4 sides, there are little mistakes here and there -- just because old samplers have those -- and the verse is over one thread. I don't know why, but the buildings on the left remind me of the Grand Canal in Venice... but then, there comes the tree, and that blows Venice! 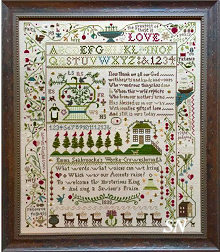 A very pretty sampler, with a neat verse -- offered as a chart. Shakespeare's Peddler is back designing again -- and we are thrilled! 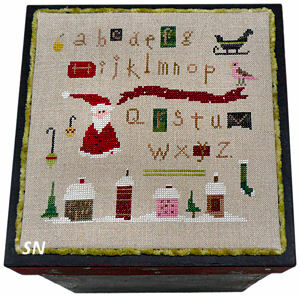 New this week is Primitive Christmas -- a cute spot-motif type piece with little Christmassy bits scattered about! 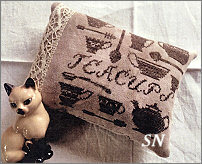 Offered as a chart, the design finishes approx 6 x 6 on 36ct natural linen. It calls for Weeks or DMC flosses, and is shown finished as a paper box topper. No buttons or special stitches... this is just easy and fun stitching. It'd make a nice box to hide your ornament hooks in! I always keep those out after I trim the tree -- so if I get any new ornaments during the season -- I can find my hooks! I just keep my pretty container right under the tree! Raise the Roof has a companion piece to Boo*Scurry*Yum! Jolly*Joy*Jingle is stitched with the same flavor of cute motifs and yummy colors and lots of Just Another Button Company buttons embellishments -- everything here and there to make you smile. 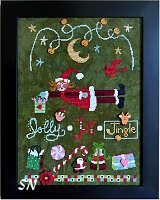 Worked on Swamp Linen from Picture This Plus -- that terrifically mangy green background sets off all the bright colors in Santa's flying elf and her friends. Offered as a chart with buttons and fabric offered separately... looks like you're months ahead of schedule if you start this for next Christmas!!! Very Cute. 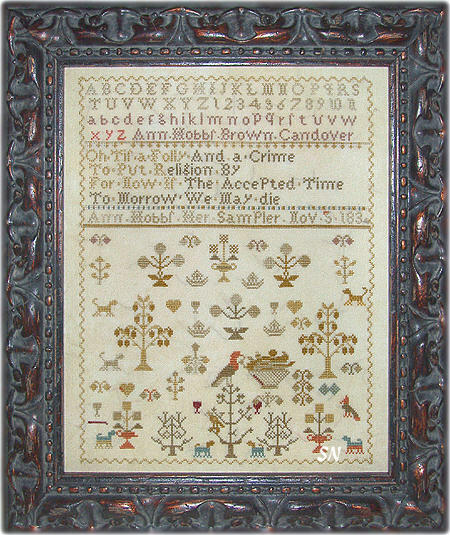 The neat primitive border is different everywhere, and Theresa mentions that she has stuffed lots of little motifs in here -- just where-ever. There are Spider Web roses in the basket which are stunning! A very pretty piece... this measures 301 x 297 -- so finishes a generous 19 x 19-ish on 32ct. Offered as a chart, coded for silks or DMC, so get out your overdyeds and see what you can customize to your piece!! Remember *A Part of Ann Dale? * Well... this is ALL of Ann Dale! 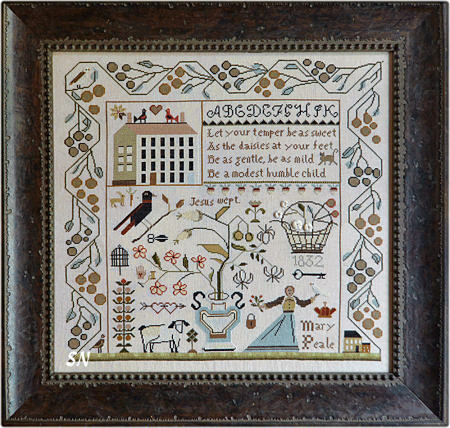 A stunning reproduction of an antique sampler stitched and signed by Ann Dale in 1827, Teresa Venette has had a wonderful time presenting this beautiful piece to us! (I wanna start it RIGHT NOW!) Huge, huge, the stitch count of this is 402 x 531. Choose a fabric you like -- you'll execute over 65,000 X's in here!!! 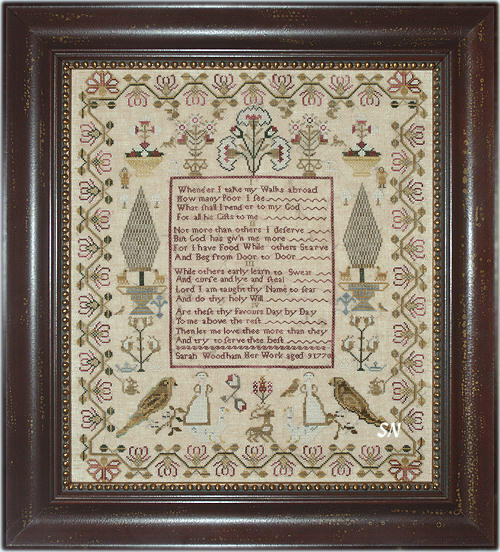 Teresa gives us a whole page of her *stories* about this piece -- Ann must have come from a wealthy family, as red threads were much more expensive than other colors -- and this is full of gorgeous red colors. All the floral urns in here -- all the traditional sampler elements, the splashes on teal near the bottom -- when you pay attention to this piece, you'll fall in love! 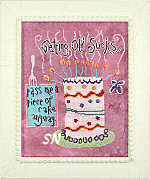 Teresa warns you to choose a fabric you like, and has charted this for silks, DMC or Sampler Threads. BUY ENOUGH thread, she says... and change your colors if they aren't grungy or bright enough for you -- this is YOUR piece! If you want smaller options -- look at *A Part of Ann Dale* and her other 'take-out chart' *Anne Dale's Flower Book* which is the compilation of all those urns in here -- without all the animals and borders. Lots of options here... on 36ct, this finishes a whopping 22-1/2 x 29-1/2! Offered as a chart. Love it, Love it!!! 'Tell me ye knowing and discerning few -- where I may find a friend both firm and true.' 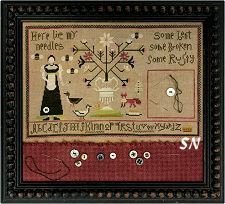 One of several new designs... the latest Jenny Bean Sampler from Shakespeare's Peddler. This is charming, both in verse and design! Neat houses, trees and landscape, lots of little critters scattered about, I love everything about it! 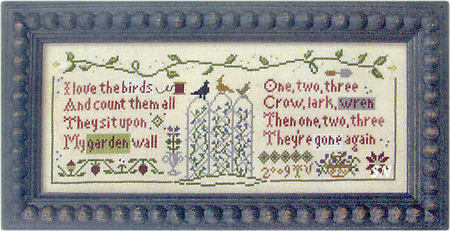 Offered as a chart, it finishes approx 10 x 13 on 32ct, and is stitched with Gentle Art's hand-dyed Sampler Threads. 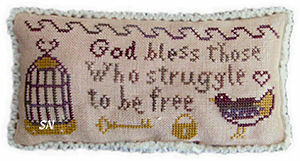 God Bless Those... Who struggle to be free. Her model is made into a pin-cushion piece, stuffed with something heavy -- like rice or walnut shells. Doesn't need any more description from me... that verse says it all! Celebrating UFOs! License and Pin Set! One of my favorite finds at Market came from Teresa and Sue at Raise The Roof. UFO is the affectionate name assigned to Un-Finished-Objects. You know... the stuff you started years ago, but just can't stand to look at anymore... you'll never finish them. This Licence and Pin Set can *set you FREE! * Somehow, Teresa's creative brain decided that it was OK to CUT UP some horrid thing you've started... and make a totally *dorky* pin cushion out of it... decorating it with this official UFO medallion and space-ship pin!!!!! Oh my gosh... this is the funniest thing! Don't let this ugly model picture deter you! Your Official UFO License includes a coupon giving you permission to destroy what was, once, a piece of needleart! Her story that comes with it is delightful... and I cannot tell it here! 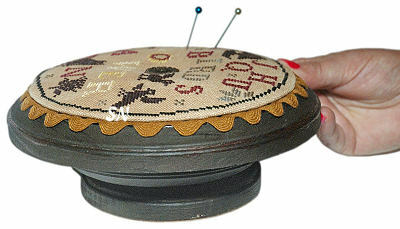 YOUR pincushion could never look like hers... because each UFO has it's *own putrid personality!*... 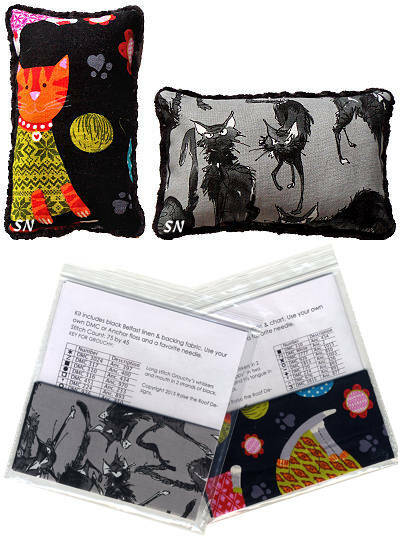 but think of the stitch group gift possibilities here!!! Everyone could make one, and it could be the gift exchange! 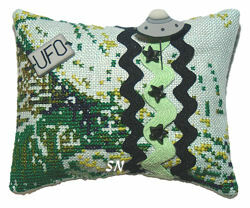 You could raid the bottom of your friend's stitching tote, secretly steal her *embarrassment,* and turn it into the most charming UFO Cushion... presenting it to her with honor! Teresa's imagination at work!!!!! Anyway, Raise The Roof's UFO License comes with a bit of History, finishing suggestions, Teresa's *unfortunate* example -- pictured in living color, and the exclusive UFO label and space-ship pin. YOU supply the awful needlework!!! We have extra Space Ship pins available, in case you have more than one *Special Needs* piece!!! 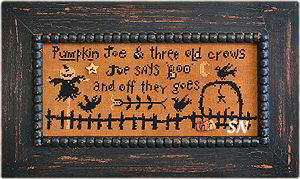 Pumpkin Joe and three old crows, Joe says 'Boo' and off they goes! A fun little piece of orange and black delight, get that yummy hand-dyed linen, a mangy black hand-dyed cotton or silk, and add a few JABCO buttons, this is really cute! Raise the Roof's newest Halloween design is too darn cute to be very scary! 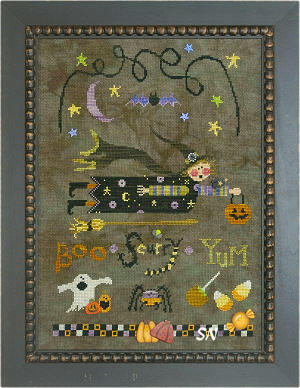 It features a witch-in-flight complete with billowing cape, wispy broom, the dark, swirling night-time sky, and lots of seasonal friends on the ground below! Check out the ghost for BOO. The Spider for SCURRY -- gotta love his hairy legs! And, YUM's candy corn and caramel apple. 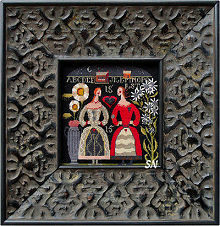 Offered as a chart, this measures approx 8-1/2 x 12-1/4 on some dark and mangy 32ct linen. Worked in hand-dyed Sampler Threads, JABCO has a set of buttons gracing this, too. VERY CUTE... this'll make a great seasonal decoration. Something about it is cheerful, colorful, fresh and fun. 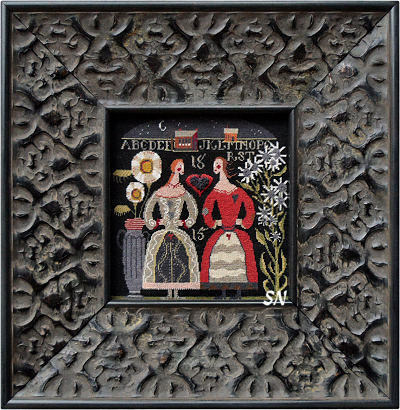 What a pretty piece by Shakespeare's Peddler -- the house, the alphabet, the border and basket -- and of course the lock and key to keep all safe and sound! 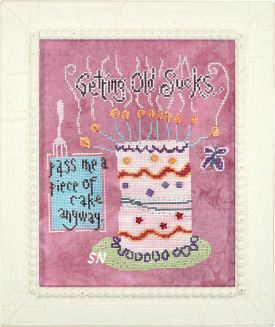 Teresa's sampler has a stitch count of 145 x 95, and can be stitched on almost any fabric of your choice. 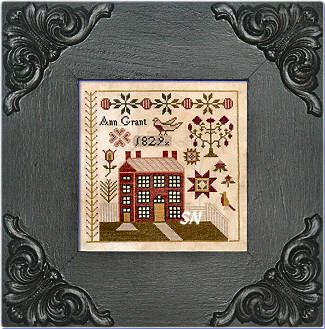 Here's the 2011 version of the house and several other motifs directly from Ann Grant's 1829 sampler! Same shapes, brighter, deeper colors, less than 40,000 stitches -- because we don't have as much time to stitch these days as Ann did! Isn't this a fun way to compare both pieces? Offered in small chart format, coded for silks or DMC, these colors are NOT the same as those in the larger piece! This is CHARMING!!! 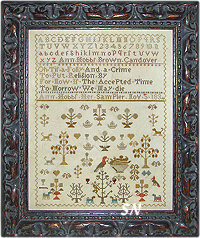 Grab a 10 x 10 cut of 32ct linen, and whip up this fun ABC sampler using 6 different limited edition Sampler Threads. LOOK at the letters seemingly scattered on top... I can read 'birds, cat, boat, flower, '... and they're all pictured there... but it's so cleverly scattered... one might miss it! Pretty navy, wines, taupe and a bit of yellow, the center is tufted with one of Homespun Elegance's Olde Brass Buttons. What makes this Roundy so darn cute, is that *Little Roundy Base* it's perched on! Teresa told us how to make those... so it's our next Saturday's Shop Gal Project of the Day... we're going to make a bunch for you! 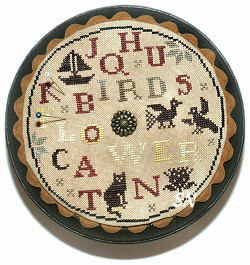 Like a miniature 6-inch foot stool, the bases stand approx 3 inches high, so your finished Sampler Roundy will be totally unique, charming, and unlike anything you have now! Painted and waxed in black, maybe you have something else you want to finish like this, too? Stitch on any bit of 32ct linen from your stash. Oh my gosh, this is DARLING! Stuffed full of overdyed color, there are a million motifs scattered about on this. Packages, sleigh bells, the staircase decorated with greenery, the snowman out in the yard, and even Santa tip-toe-ing up to the house -- I think he's too fat for the little chimney! 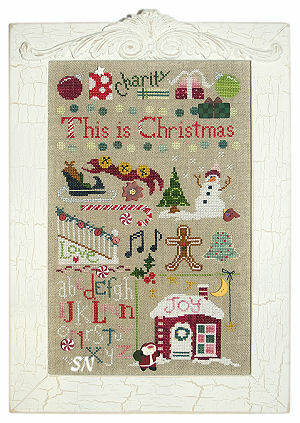 'This is Christmas' is offered as a chart and finishes approx 7 x 12 on 32ct. Just a fun piece, you keep seeing something new every time you look at it! Button embellishments offered separately. '12 Million ghouls and goblins can't be wrong!' 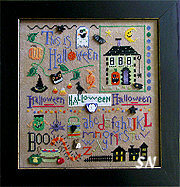 Raise The Roof has a fun new design for Halloween -- a medley of stuff, crammed and scattered -- here and there -- in it's 8 x 8-ish design size. Stitched in overdyeds, the clay button embellishments are everywhere in here! Bats and cats, owls and toads, there is a vampire, and even a poison apple! Very busy, very cute... offered as the chart with button set separate! 'You will surely reap what ye sow.' 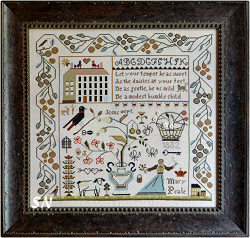 Jenny Bean stitches this charming sampler... it's her third! With a stitch count of 180 x 180, yours will finish approx 9 x 9 on 40ct... or it could be 11 x 11 if you choose 32! Pick what makes you happy! Worked in Gentle Art overdyed Sampler Threads, the colors are very pretty pinks, lavenders, greens, some brown, and a *touch* of a mustard color. A spot-motif-type of arrangement, all the sections feature pretty designs -- the flower urn in the upper left corner is pretty all by itself, the house is cool, and so is the willow tree! 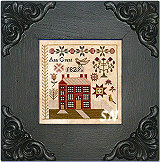 Teresa's been sampler shopping... and found a pair of almost identical samplers stitched by two sisters in 1837. She bought the pair, and has been re-charting! Jane's is presented this year... Sarah's maybe next year! Stitched in Ramsgate, England, Jane was most likely a persnickety and tidy girl. 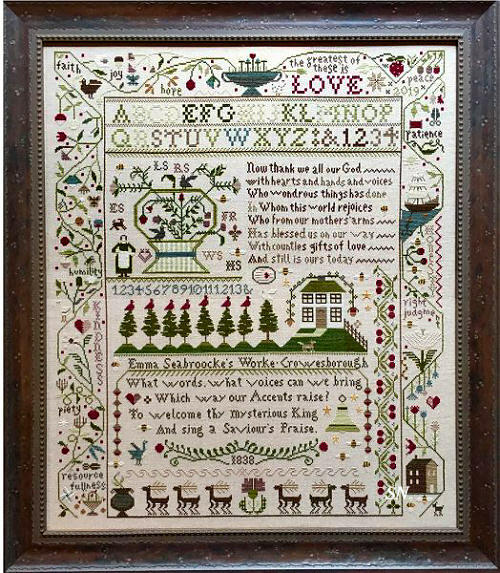 Teresa's bits of musing that are included with the chart talk about Jane's stitching, her colors, and her snake -- that was evidentally not cross-stitched at all, but embroidered. Pretty flowers, beautifully shaped and detailed trees there is a lot going on in here... but it quite an endearing piece! Charted for either silks for DMC, it's quite large, and measures approx 19-1/2 x 27 on 28ct... to 14 x 19 on 40! Very well done... we have the model in the shop, and it's stunning! Simply lovely, this piece has such balance, pretty and graceful motifs, awesome color, and just general CHARM! One of Teresa's favorite parts are the two girls near the bottom that are standing there with their hands on their hips! Definitely a happy sampler! Offered as a chart. 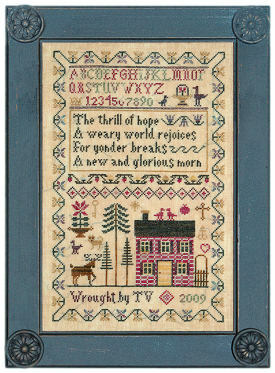 This is another sampler residing in Teresa's *Private Collection* (how neat is that!) that came from England. 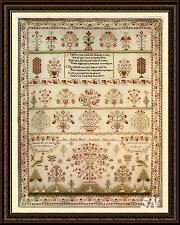 Originally stitched in 1834, the color palette of this features soft shades of beige, blue, gold, rose and coral -- so lovely! Teresa includes a page of history about Ann, where she came from, and speculation about ink spills on her original piece. That sort of thing is so much fun to read about! 'I love the birds and count them all. They sit upon my garden wall. One, two, three, Crow, Lark Wren. Then one, two, three, they're gone again.' Something pretty and totally *finishable* for a busy stitcher!!!! Offered as a chart. Teresa of Raise the Roof must have a split personality!!!!! 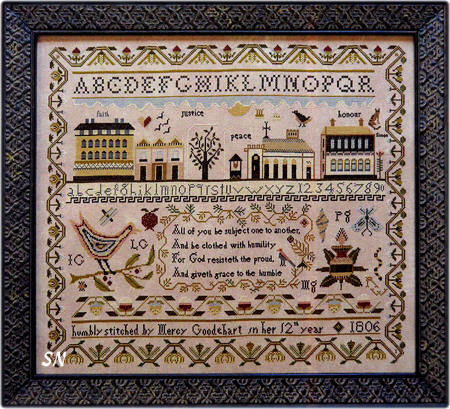 She's designed this lovely little sampler -- under her other name of Shakespeare's Peddler that features words from 'O Holy Night.' 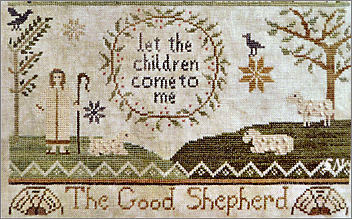 'The thrill of hope, A weary world rejoices, For yonder breaks A new and glorious morn.' 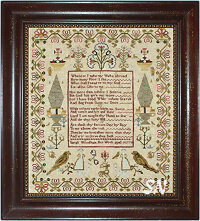 Teresa has a couple of paragraphs inside the pattern that tell of her inspiration for this piece... and the meanings of the symbols she has included in her original design. Just makes my heart warm all over!!! 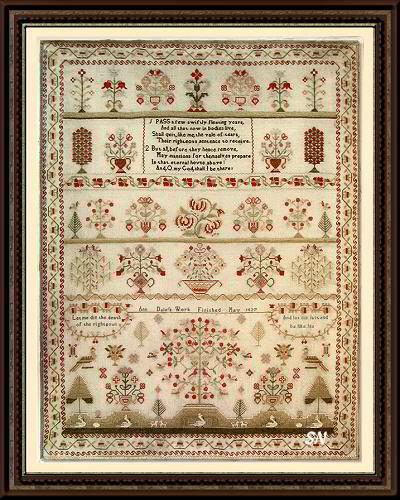 Of special note are the colors called for in this sampler. Gentle Art dyed a special set of Winter Threads last year... and Teresa used that Limited Edition set! Not to worry, though! She has also converted those colors into those in the regular line in case you didn't get it. But if you were lucky enough to collect that little bag of threads this year -- HERE is something awesome to stitch with them!!! 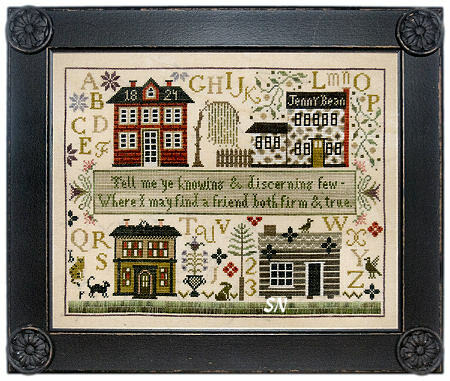 A petite sampler, this finishes approx 8 x 12 on 32ct... but you can choose any count you wish. Offered as the chart. BUT, pass me of piece of cake anyway! Lots of stitching in this one to commemorate a special birthday, but then again... there might be a lot of birthdays to commemorate! 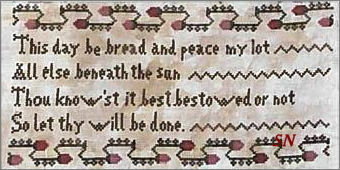 Offered as the chart, this finishes approx 7 x 8 on 32ct and is stitched in overdyeds. Little confetti buttons decorate the cake, and I think the candle flames would be fun stitched in metallic!